No matter what kind of business activities you undertake on the internet, there is one fundamental fact that cannot be ignored. Whether you're promoting internet marketing products, or selling blue widgets from a sales enabled website, you cannot hope to be successful unless people visit your website. However, having just anybody visit your site is not enough. In order for your business to be successful, you must attract site viewers who are interested in the product or service that you are promoting or selling. In other words, your visitors must be targeted prospects. For example, if you are the biggest supplier of blue widgets in your locality, it is not going to help your business if everybody who visits your site is only interested in buying red or green widgets. Similarly, if your site is promoting an internet marketing product that is related to selling on eBay, you’re not going to make many sales if the people who visit your site are interested in advanced search engine optimization techniques. Of course, you do not necessarily want to stop people visiting your site. Even visitors who initially have no interest whatsoever in your product or service may be convinced to do business with you if you have an effective sales page related to a product that they gradually begin to see a use for. However, most of your sales and success will be based upon targeted visitors landing on your site. Keyword research is fundamentally important to the process of driving targeted visitors to your website. They say that the success of your business ventures online is predicated on how successful you are in your keyword research efforts. There are many different ways of undertaking effective keyword research. ‘The Keyword Research Bible’ contains many of them. Many of the methods that you are about to read of are free, and for most people these free tools are more than adequate. 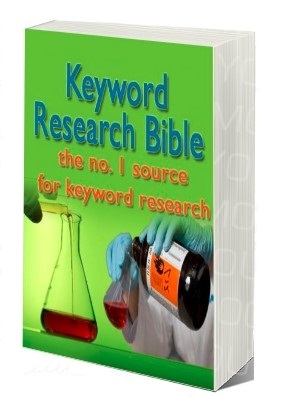 There are, however, some more advanced keyword research resources listed later in this book that will cost you money. However, given the importance of good keyword research to the overall success of your business, any money that you spend on the best tools is always going to represent money well spent.